Imagine how much more efficient the justice process could be if telepresence was integrated throughout each stage. A suspect for an impending case would never have to leave the jail where he is being held, forensics experts could testify remotely and prisoners could meet virtually with their parole officers. Using video technology can also save the cash-strapped court and corrections systems' money and time, combatting the rising costs attributed to an increase in the United States' prison population over the last decade. 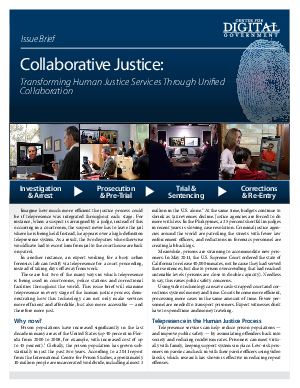 Download this brief for a detailed examination of how telepresence in every stage of the human justice process can not only make these services more efficient and affordable, but also more accessible.